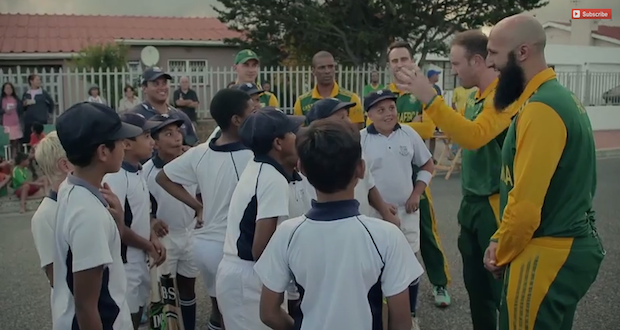 The Proteas have already captured the imaginations of South Africans with their exciting play in recent weeks, now theyâ€™re capturing hearts with a video showing team members, including captains Hashim Amla and AB De Villiers, surprising a young fan at his home in Southfields, Cape Town. Kieron Adam, who plays for hisÂ under-11 cricket team, says Amla is his favourite player, â€œbecause he is humble and the way he batsâ€. The moment the boy walks into his living room to find his heroes waiting for him to arrive brings a lump to the throat â€“ and it only gets better from there. As the team prepares for the World Cup in Australia and New Zealand next month, here’s hoping Kieronâ€™s advice can help the Proteas bring the trophy home. – Featured image: Screenshot from Cricket SA video, via YouTube.